Joe is the king of quirk when it comes to gifts. One year for our anniversary he took me to an African Lion Safari in Canada, where the baboons tore the antennae off of our car. 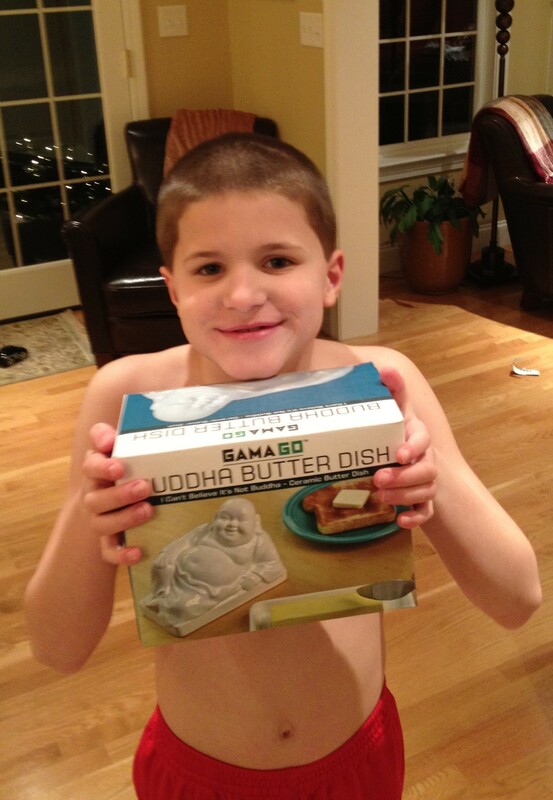 This Christmas he gave me a butter dish shaped like a Buddha. Last year, our family did not have a very nice Valentine’s Day. Oh, we intended to have a fun day of celebrations and chocolate-y gifts, ending with dinner at our favorite restaurant. But things did not go as planned. After school last year, the kids crowded into the kitchen, all pink cheeks and red Valentines and gooey chocolate kisses. The day had a festive air about it, and they were all chatting and giggling about their parties and treats, when I noticed Jack scampering into the bathroom with a pained expression on his face. And from there, all hell broke loose. For the next two hours the other four kids looked on, horrified, as Jack screeched and cried and made a mess of every bathroom in our house. And as I followed him up the stairs and back down again, calling Jack come here come back and begging him to calm down, I was frustrated and angry and sad. The day ended with my tears, disappointed kids, and bright orange macaroni from a blue box. I wasn’t frustrated or angry or sad because of the mess he was making or that we had to stay in for Valentine’s Day or the celebratory mood of the day had vanished. Instead, I was thinking about the day my son was diagnosed with autism five years earlier. I was thinking about sitting in the tiny office of the developmental pediatrician’s office and how Jack had slammed his shin on a filing cabinet in the cramped space. The kindly doctor watched my toddler whirl and twirl around the room and gently, oh-so-gently he asked me does he ever come to you comfort. And I answered no. And five years later, as Jack whirled and twirled through the house trying to rid himself of bowel distress, I realized that he still does not seek me out when he’s hurting, a sign of his spectrum disorder. A sign of his detachment. This year, I had high hopes for the heart-filled holiday; I’d carefully selected small gifts for each of the kids, and helped them all write their Valentines. Joe and I talked about where to go for dinner Thursday night. But by Tuesday afternoon, every one of the little people had come down with high fevers and headaches and dinosaur coughs. Come Valentine’s Day, all five kids were still sick and home from school. Once again, the holiday was shaping up to be crappy, no pun intended. (Sorry, Michael, sorry. I couldn’t help myself!) They’d spent two days convalescing on the couch and watching so much Scooby-Doo I was convinced our TV was going to melt. Around noon, I decided they needed to at least shower and change into some fresh clothes; Rose had been in the same nightgown for two days. As they grumbled and headed upstairs to the bathroom, I heard Jack start screaming. I started up the steps and Charlie turned to me, his face stricken, and said “He has a really bad bloody nose. Hurry!” I raced up to the master bathroom, where Jack was leaping and bounding, blood streaming down his face and all over our (white-carpeted) floor. Chasing him as he bounced from one side of the room to the other, I couldn’t help but think of last year’s Valentine’s Day, when he ran from bathroom to bathroom with a mess down his legs, on the floor, on the walls. I couldn’t help but be reminded that here we are, exactly 365 days later, and not much has changed. Jack still does not come to me—his own mother—for comfort when he’s hurt. And racing around the bathroom, calling his name and telling him come here Jack come here please come to Mommy, I was deeply saddened. “This is the WORST Valentine’s Day EVER!” I had to agree. Last month we went to Cancun for a dental convention, where we learned—among other things—how to make a margarita. As our group piled into the test kitchen of the upscale hotel, the head chef demonstrated how to measure the tequila and mix in the ice, how to pulse the blender while adding just the right amount of fresh lime juice, extracted from the fruit with a small juicer. I looked across the kitchen to see Joe begin to make us margaritas with fresh lime juice, as he simultaneously admired Rose’s valentine, carefully wiped Jack’s threatening nose, and played a board game called Beat the Parents with Joey and Charlie while Henry bellowed out the answers. And watching him in that moment, I realized that all these years he has been offering his peculiar presents with quiet meaning, with unspoken intention. His gifts are bright spots on long days filled with bathroom messes and bloody noses. Days filled with the setbacks and stumbling blocks of autism. Things like Buddha dishes and juicers and safari trips are reminders to look on the bright side, the funny side, the hopeful side. The side that says maybe Jack doesn’t need your comfort now but one day he might. The side that says look how far he’s come already. And although there will always be heartache and fear and sadness, there will also be fresh tart limes and creamy cold butter to bring us comfort. Beautiful. Just… beautiful. Some yarns are better spun with a little crimson thrown in, right? I absolutely love the Buddha butter dish!! Years ago we were visiting a friend in Germany and found he liked to collect little statues of Buddha. Later that night at a restaurant, I asked him if they had any butter (for my bread) in his stilted English he asked me, “What is butter?” I showed him how it could be spread on my bread. He said, “Oh! (then what sounded like) Buddha? !” I then asked him how he said the name of his little statues with the big belly and he replied with, ” Budda!” sounding like, butta!!!!! Get it? Anyway, I was researching you after finding Riddle Brook Publishing online. I research for my daughter’s manuscript about her gap year studying monkeys in the rainforest before college. (Mount Holyoke College) Would love some input on it maybe some advice as well. You sound extremely busy, though, a lot of young ones!! Both my daughters have recently graduated MHC and chose to live in MA as apposed to where they are from, Florida. I miss them terribly. Enjoy this hectic time in your life, it will go by fast!!!!!! !